CINEC Maritime Campus which is the largest maritime training institute in South Asia signed an agreement on 17th November 2013 with the Government of Fiji and the Fiji National University, to manage the Maritime School of the Fiji National University (FNU) in Suva. Minister of Public Enterprises and Attorney General, Hon. Aiyaz Sayed-Khaiyum signed the agreement on behalf of the Government of Fiji. Capt. Ajith Pieris President of CINEC Maritime Campus and Vice Chancellor Prof. Ganesh Chand of the Fiji National University were the other signatories. Mr. J M S Brito Deputy Chairman, Aitken Spence PLC and Dr. Parakrama Dissanayake Chairman, Aitken Spence Maritime and Jt. Managing Director CINEC were in attendance. This is a further expansion of CINEC Maritime Campus which recently took over the management of the Seychelles Maritime School. The management of the Maritime School of the FNU by CINEC, will fulfill a long standing need of the Government of Fiji to produce well-trained Seafarers from the Island nation. The Maritime School has courses up to Watch Keepers and with CINEC’s involvement, the School will be able to provide courses to the category of Officers and Engineer Class 1. This is yet another landmark achievement in keeping with the objectives of the Government of Fiji to generate real growth in the Fijian economy by generating new employment opportunities. 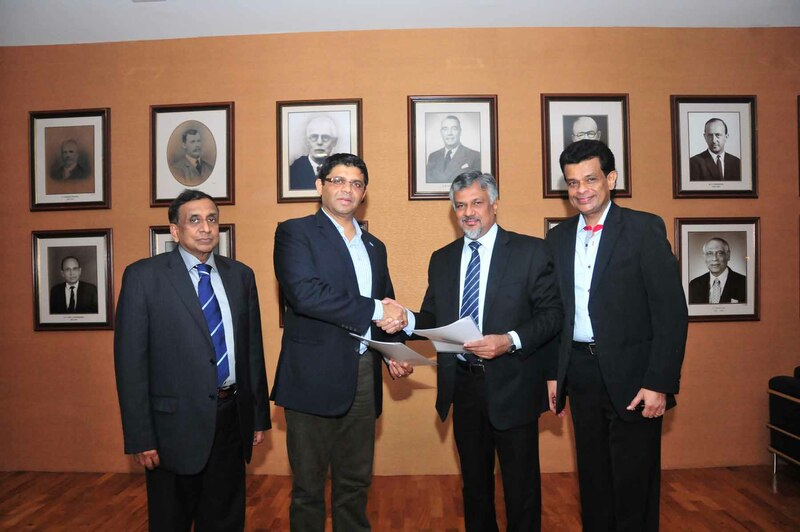 Standing from L to R: Mr. J M S Brito – Deputy Chairman, Aitken Spence PLC; Hon. Aiyaz Sayed-Khaiyum – Minister of Public Enterprises and Attorney General, Fiji; Capt. Ajith Pieris President of CINEC Maritime Campus and Dr. Parakrama Dissanayake Chairman, Aitken Spence Maritime and Jt. Managing Director CINEC. Standing from L to R: Mr. R G Pandithakorralage – Director/Chief Human Resources Officer, Aitken Spence Group Ltd; Mrs. N W de A Gunaratne – Managing Director, Aitken Spence Insurance (Pvt) Ltd /Aitken Spence Insurance Brokers (Pvt) Ltd and Chief Legal Officer, Aitken Spence Group Ltd; Mr. J M S Brito – Deputy Chairman, Aitken Spence PLC; Hon. Aiyaz Sayed-Khaiyum – Minister of Public Enterprises and Attorney General, Fiji; Capt. Ajith Pieris President of CINEC Maritime Campus; Dr. Parakrama Dissanayake Chairman, Aitken Spence Maritime and Jt. Managing Director CINEC; Capt. Dr. Nalaka Jayakoddy – Vice President of CINEC Maritime Campus and Capt. Peshala Medagama – General Manager – Business Development, CINEC Maritime Campus. For more information on our Group, our operations and our capabilities please visit our site.